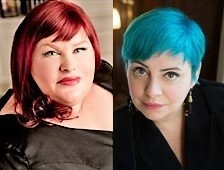 Bestselling YA authors Cassandra Clare and Holly Black are visiting the UK for a sell-out tour from 20 to 27 February. Clare is the author most recently of Queen of Air and Darkness (Simon & Schuster), concluding her Dark Artifices series; Black's most recent novel is The Wicked King (Hot Key), published last month and with home and export sales to date of 80,000 copies. The duo collaborated on the Magisterium series (Corgi).